Kit review of EVA's Harrison Schmitt figure. Overall Rating: 10 - Definitely a sharp model when finished. 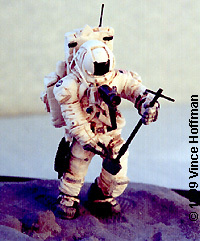 Apollo 17 is the subject of two of EVA's solid line of space suited astronaut figures. 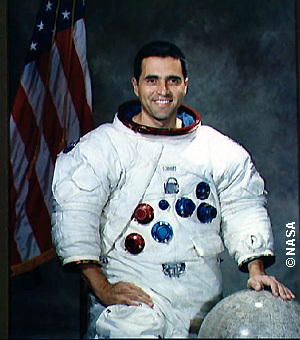 Harrison Schmitt, the lunar module pilot, is very nicely reproduced in this kit and appropriately represents one of the two last men to walk on the moon. 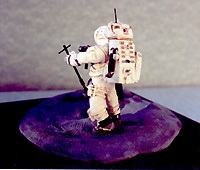 The model came with 9 resin parts, one wire and 3 plastic rods of varying length and diameter. Decals are not included in the kit, which is the only drawback. I highly recommend purchasing EVA's separate decal sheet, which has all the markings (and more) for every Apollo mission. Instructions for placement of the many decals are not included in either package, so good reference material for this kit is required. The instruction sheet is good, but provides very few illustrations for assembly of the parts. One piece had me baffled, the sample bag top, but a quick e-mail to Chris at EVA cleared up the mystery. Close inspection of the pieces do not reveal the extreme attention to detail paid to his more recent 'Krechet' model, but the shapes are there and most details are easy to pick out. Construction is straightforward; having only one arm in the kit to choose from meant that I wasn't going to be counting thumbs to determine left and right arms. 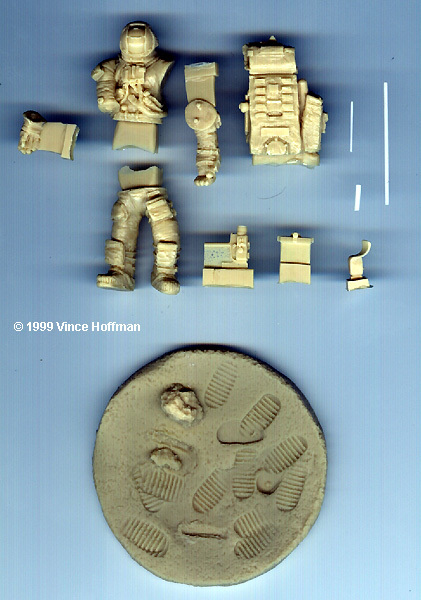 Each part was removed from the sprue and cleaned up; large pour stubs were easily removed from the torso, leg and PLSS pieces. The sprue on the arm piece is attached at the top of the shoulder so when the part is cleaned up, care must be taken to sculpt the sprue to the right diameter around the shoulder. Care must be taken when attaching the arm and hand as some folds in each piece correspond with the other, note that these folds help to align the parts. 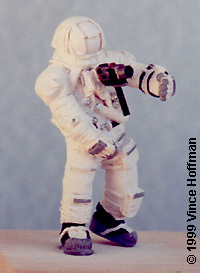 After the arm and hand are attached, the legs are securely glued to the torso assembly and the whole figure is then attached to a block of wood to make it easier to paint. Do not attach the shovel, sample bags or the PLSS at this time, as they will only hinder the painting process. 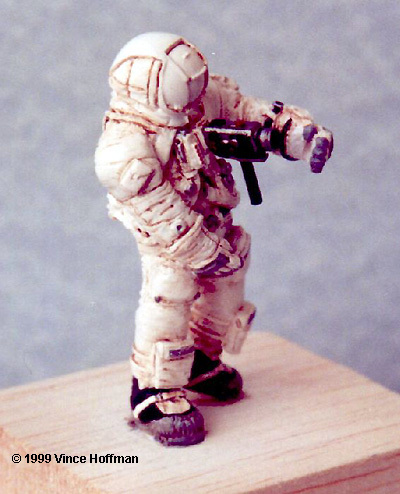 After construction, several light coats of gloss white are airbrushed over the model. Gloss paint is preferred to flat paint because it dries very smooth and is much more forgiving when a wash is applied. After the white base coat has dried, all of the details are painted in their appropriate color, I carefully studied the cover photograph and visited the web site to determine all the different details and colors. 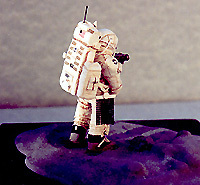 After studying photos of the real suit, the various mechanisms on the rear of the PLSS and front of the suit became more obvious and easier to paint. Close up photos of the chest mounted camera were handy to pick out details on that little piece of equipment. At this point, the camera was securely glued to the figure. When the details are painted, the whole figure is sprayed with a barrier coat of clear gloss lacquer. The lacquer dries very hard and will prevent the wash from mixing with the base colors and ruining the finish. The figure is then left to dry for 2 days. A wash of artist oil 'burnt umber' and airbrush thinner is applied to various recesses to accent shadows. 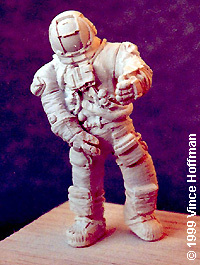 Small areas of the model were painted with the wash then wiped off with a soft cloth. It is important to do this to areas about a half square inch at a time because the thinner will evaporate quickly and leave heavy deposits of pigment. The oil wash took about 4 days to completely dry. After the oil wash has dried, a light drybrush of white is applied to tone down the heavy shadows caused by the wash. The shovel handle is assembled according to the instructions and is slipped into the left hand. At this point, you should position the hand held sample bag in the right hand according to the angle of the shovel handle. If the handle is glued in place before the bag is put in place, then an unrealistic mis-alignment will occur between the two. A light spot of glue holds the shovel in place on the sample bag. The final pieces to be glued in place were the PLSS and the small antenna on top. The decals are applied and left to dry overnight. 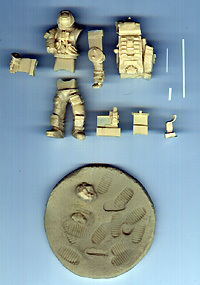 The model is then sprayed with Pactra clear flat to even out all of the textures. Only 2 items are left to paint, the helmet visor and the anodized aluminum red and blue connectors on the front of the suit. The helmet visor is done with enamel gloss black. I prefer enamel paint because it dries much slower and produces a much nicer shine than its acrylic counterpart. The aluminum fittings are painted using clear red and clear blue over chrome to replicate the shiny finish of these fittings. The final step is to complete the base. 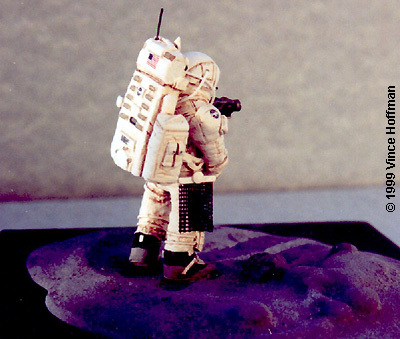 The moon surface looks very unrealistic if just painted gray and left alone, so a little imagination is required. 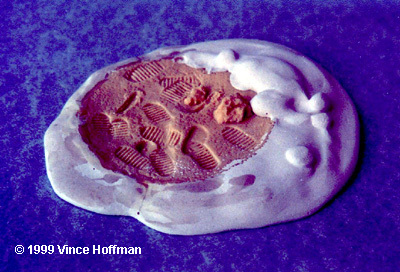 The base is first expanded from its original circular form by adding plaster of paris around it to form an uneven edge. After the plaster dries, a wood rasp takes the edges down to the size and shape I need to fit the base, and sandpaper smoothes the rasp gouges nicely. The whole thing is then painted a neutral gray to get rid of the yellow resin and white plaster colors. Grey powder is made by grinding artist charcoal sticks into fine dust and mixed with plaster until the appropriate shade is produced. The base is painted with a thin coat of flat varnish and a liberal dusting of powder is sprinkled all over the base. When the varnish dries, the dust is removed by lightly tapping the bottom of the base. The base is securely glued to a finished wood plaque and it's done ! ^Parts - click for larger view. Completed figure. Click on the following images for larger views. 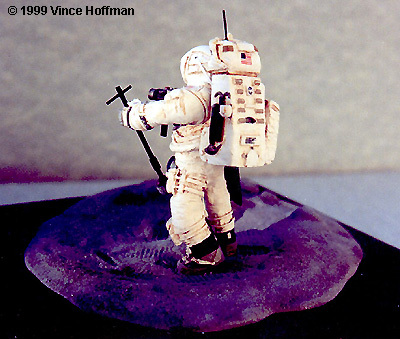 I found the Harrison Schmitt model very easy to build and paint, though I spent nearly 3 weeks on it because I had to do some hunting for reference material. Anyone who has never built a figure would do very well with this model, it is easy to assemble and there are very few colors and details to paint. Because of the high quality of casting and very fine detailing it makes a nice project for the experienced figure painter. 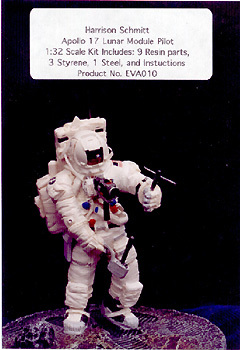 I highly recommend this kit for anyone interested in real space subjects - the price is right and Chris at EVA Models is very helpful in providing reference material and help with construction. Last updated on 13 September 1999.